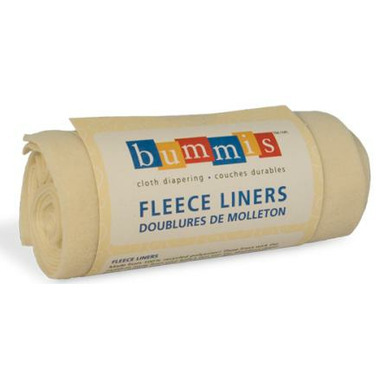 Fleece Liners are made from Repreve – “more than recycled” polyester! It’s all about giving back … Repreve is a member of 1% For The Planet, an alliance of businesses that donate at least 1% of their annual revenues to environmental organizations worldwide. See Repreve .com for more information. Using Repreve polyester is part of our efforts to be a responsible manufacturer creating sustainable products at home in North America. These do the trick! The only thing is they could be a little wider and don't keep my baby's bum super dry so he is more prone to a rash (but I should probably change him more often too haha). Much more economical than disposable liners! Great for keeping baby's skin dry. Use them with our fitted diapers, especially during nap and sleep time. Not sure what went wrong, but these liners actually gave my baby a rush. I bought them to try them overnight to get the stay dry effect, but it didn't work for me. I love these, so soft and no problems!! We love Bummis. These are fabulous for keeping wetness away from baby's bum. And a great price! Highly recommended. Another GREAT Bummis product! These have changed the whole diaper rash scenario in our household. I tried another company liner as well, just to see which one was better and I found Bummis worked best for us. Absorbent and keeps baby's bum dry! Really thin and after a few washes they pilled and don't seem to be keeping the stay dry effect. I bought $5 worth of fleece at the fabric store and made 30 liners that are working better than these so far. Love this product I'm thinking of buying more. I love how they are washable which is affordable for me. These are super soft and perfectly sized. Dry very fast as well since they let water through but don't hold onto it. Baby still breastfed so I can't attest to it's powers with regards to solid poop. These are great. Keep my little guy dry at night and also use one if we're going out during the day. Wash and dry really easily. Great product. I started using disposable liners in our cloth diapers after my little munchkin started eating solid food. After a while they started to get a little expensive and wasteful (which was the main reason I was avoiding disposable diapers) so I bought these based on reviews I had read. So glad I did! They're super soft and keep baby dry. They also wash and dry easily. I use these all the time with my Grovia diapers; just lay the fleece on top of the booster. Easy to wash and dries super quickly. I love these! it makes such a big difference, I use it at night mostly or when I'm going out. Baby is so much more comfortable! Great for a little added comfort at night time. I notice they dont move as much as the disposable liner. My daughter has very sensitive skin to the point that I can't use disposable diapers with her without her getting a rash. Even in cloth if left too long she gets a rash (I'm talking 2-3 hours aka a long car ride or even nap time). Using these liners has made a big difference because it helps keep her bottom extra dry so I don't need to change her the second her diaper is wet. Definitely worth the money. I have a multitude of different fabric liners and so far these are the best in my stash. They are soft and cosy, and although eventually pile, they remain soft. I started using these with my GroVia diapers to help with staining. Solid food poops either slide right off or get sprayed off without issue with the diaper sprayer. I now have more than enough for every cotton diaper insert I own!!! Feeling dry and easy to clean! Perfect match. Work well to keep diapers clean and my little one dry. I like to use these in all my cloth diapers, mostly because they seem to prevent diaper rash for my little guy, but also because they are easy to clean, come out stainless, and protect my diapers from stains. Tots Bots diapers come with fleece liners that are a little wider and they are great too. these liners are great. I used to use the disposable liners, but with my second child, his poops are quite firm and they just fall off the fleece liner, which makes clean up very easy. They seem to keep baby drier than the disposable liners. I use them with my grovia AI2 diapers, with a booster. These liners must be loved by mommys who prefer microfleece but I'm not one of them :) Otherwise they are thin and soft, easy wash, long enough but not wide enough. I definitely prefer natural disposable liners but cannot say that these doesn't work well. I have ordered two of these packages. They work very well. I like the fact that they are not white, because they don't show stains at all. I would like them to be a bit wider, but this is just a standard size for all brands I know! I have been using it only for a couple of weeks on my 3 month old DD but love the product! works well. Although I wish they were a bit longer! Great price and a great product! Keep bums nice and dry and make poop duty that much easier too. Love these!!! They keep my LO bum dry (even at night) and daytime clean ups quick and easy! Adds extra ease when my LO is being babysat, when I get the dirty diapers back I just have to toss the dirty stuff from the liner, rather then scrubbing my whole diaper :) as I prefer not to use a disposable liner. Love these! They're so easy to use and keep diapers looking nice and white! They're nice and soft and keep their shape well. I've purchased 3 of these and am very happy with them. I love these liners. We were originally using them just overnight for added dryness, but now we use them in all our diapers instead of using disposable liners. As mentionned, solids come off easily and stain resistant. Super soft! These are super soft and always stay dry! I purchased these to line my prefold diapers. I really like them; they are very thin so they don't add bulk, and they are very soft against my boy's skin. They did seem to wick the moisture away. My only dislike is that the material began to pill slightly in the wash. They are still soft though. These are awesome. Thin, easy to wash, and they keep my baby's skin dry, even when the cloth diaper underneath is soaked. I love these liners! They are not bulky and they are super soft! These are great for keeping my baby's bum dry when in chinese prefolds overnight. Yes, it would be cheaper to go to the fabric store and cut up some fleece, but I don't have time for that. excellent, perfect, exactly what I needed. Great quality & saves money buying reusable ones. I just wash them along with my diapers. Excellent product! Keeps my babe dry between changes at night and washes up beautifully. Great liners for cloth diapers. Nice and soft and they wash well too. Great to keep diaper creams off your expensive cloth diapers and helps keep baby drier too. These are great and so soft! Make clean up of the diaper easy. Less staining.